The fall of 2000 in the Altai Mountains was particularly warm. 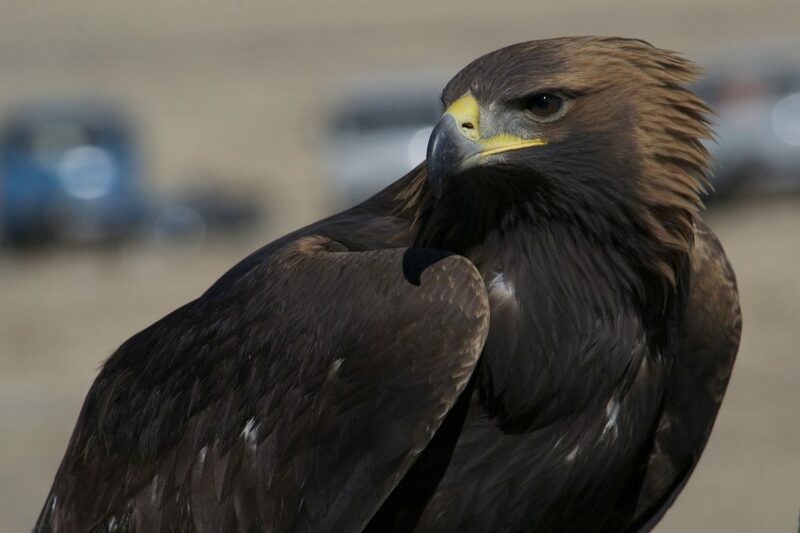 After exploring parts of Hovd province, my mission was to travel to Bayan Ulgii province to participate in the first ever Golden Eagle Festival. The idea to organize the festival, centering on Kazakh hunters who use trained Golden Eagles for hunting, was born a year earlier. In the previous year, my former employer and I decided to make a scouting trip to the Altai mountains for our next business opportunities. We had already visited Lake Hovsgol, Kharakhorum and the Gobi desert previously. I persuaded that we had ought to visit the remote western Mongolia for further operational opportunities. A winter earlier, I also had traveled in the region as a guide for a prominent fashion designer from New York City during which I fell in love with Kazakh hunters’ bravery, humble but hard working lifestyle and their passion for the eagles. On the last day of the scouting trip, a heavy snowfall occurred thus delaying our return flight. We were forced to stay overnight at our cook’s house. It was here the two of us, along with our three Kazakh partners, Mr. Kazbek, Mr. Medukhan and Mr.Edilkhan, sat around a table and discussed our future plans. We all agreed to devote our actions to promote the tradition of hunting with Golden Eagles, a practice inherited less and less each year. Then the idea to arrange an annual festival was borne. Jalsa, who is also an American born ethnic Mongolian, suggested financing the festival. In the following months, I would spend numerous hours discussing the details with Kazbek, Medukhan and Edilkhan trying to find best solutions in promoting and organizing the event in best possible ways. On the morning of the first festival day, I’m now standing in the central square of the provincial capital Ulgii, nervous and wondering how many hunters would show up. Then to our delight, sixty five hunters came in galloping with their eagles sitting on their arms. It was a majestic scene and I still have the video footage of this first ever eagle hunters’ parade, probably in the world, ever. The hunters then rode off a short 20 kms to the main festival competition site known as Chandmani Hill. On the first day, the eagle released from the hill top as the owner would be calling her to himself in the valley floor. After much discussion, we had agreed to choose the best eagles based on various categories including hunters with best traditional costume and equipment; best communication techniques between the eagle and the hunter and last but not least, the fastest and most attractive descent of an eagle from top of the mountain to the owner located on the valley floor. The idea of best costumes and matching outfits for the eagle and her owner brought back some of the most forgotten traditions and skills back to practice. For example, we would later see that Altai soum hunters would start making their hunters’ clothes and outfit based on processing animal hides in the old ways as well as trapping system. After much discussion, we had agreed to choose the best eagles based on various categories including hunters with best traditional costume and equipment; best communication techniques between the eagle and the hunter and last but not least, the fastest and most attractive descent of an eagle from top of the mountain to the owner located on the valley floor. The idea of best costumes and matching outfits for the eagle and her owner brought back some of the most forgotten traditions and skills back to practice. For example, we would later see that Altai soum hunters would start making their hunters’ clothes and outfit based on processing animal hides in the old ways as well as trapping system. On the day two, the eagle is called to land on what’s called as chargai, a fox hide dragged behind the horse while in a full gallop Over the ensuing years, we kept adding more events in order to ensure a full participation of the local community such as organizing a local bazaar promoting local art work and souvenirs as well as an ethnic Uriankhai archery contest which has become an important part of the festival spectacle today. 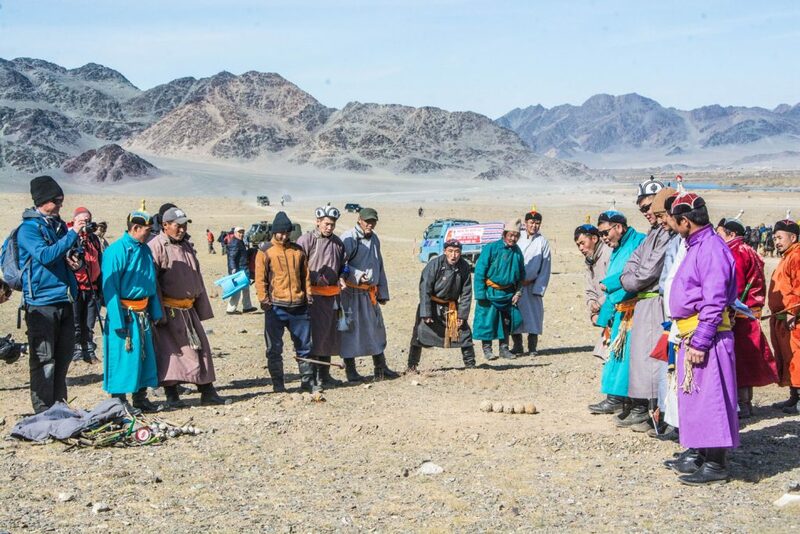 The target is small leather ball resembling an “enemy head” and the competition is based on elimination on each round until there’s the sharp marksman left Looking back, the Golden Eagle Festival was born on the true spirit of a genuine collaboration between a native Mongolian who loves his country, an American Mongolian who loves his ancestral lands and local Kazakhs who are proud of their traditions and cultures. It has now grown to be one of the best-known cultural events of Mongolia. That trip that I did for the fashion designer from NYC still remains one of my most favourite trips I have ever done. It stands as an example of what a single trip can do to bring a team of people together in promoting and preserving local traditions through sustainable means of tourism.